百万円と苦虫女 Hyakumanen to Nigamushi Onna (One million yen and the woman with a sour face), a Bildungsroman in the form of a film, seems to deify the commented adventurous category. 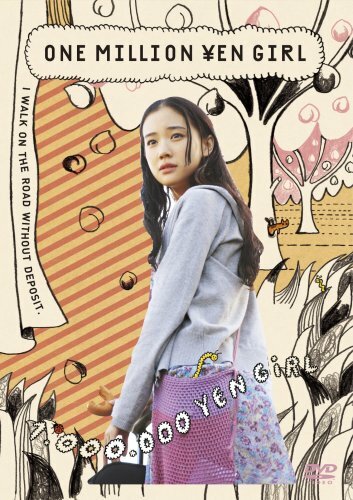 The main character’s bohemian attitude displays an on-the-road credible youngster a la japonaise –vade retro, “cool” and pretentious Murakami-, a young woman who grows and learns from experiences. However, at the same time the nomadic lifestyle keeps her forever young (like Alphaville’s classic) and prevents her from entering the adults’ world of responsibilities. As soon as work, economic and/or emotional attachments are developed, it’s time for her to go and search for a new place to make a living. That way she can escape the miseries she thinks she is fatefully carrying; an always convincing Aoi Yuu doesn’t seem to realize that what she considers a curse is actually plain adulthood. Her everlasting plans for freedom pass through some moments of loneliness and crisis but always a deus ex machina intervention channels back events into her initial scheme. The idea of saving one million yen (百万円 Hyakumanen) and departing is a good one, apart from making a great title. They could have chosen one month, or one year, or something more subjective or twisted, but the money savings account creates the perfect tension in the story and shows occurrences in a more haphazard fashion. Reader’s Response Criticism is a school of literary theory -applicable to books, films, and other forms of art- that focuses on the reader (watcher) and the way s/he is affected by the content of the book or film. Above all, it analyzes turning points in the story that make the reader (watcher) reflect and realize facts beyond appearance. In this movie there are quite a few examples of these situations, especially when depicting people’s humanity: there is the 気持ち悪いおじさん disgusting middle age man, who changes from a stalker into a protective and good-hearted human being; the apparently inoffensive and friendly 地元社会 countryside community, that becomes an aggressive mob in the line of Dogma’s Dogville; or the dedicated young gardener who becomes a womanizer who becomes a passionate amour fou victim. And the film is rounded off with a game of encounters in the railways stairs, one of my favourite scenes –along with the one in the bathtub, Suzuko’s eyes wideopen as a cat’s-, a metaphor of real life destiny as a confluence of chaotic, unpredictable and uncontrollable factors. But, as she pleasantly says in the end, “じゃあ、来るわけないか”. And the show must go on.